Send a personalized gift voucher by email, regular mail or even print one from the comfort of your home! Click on the option most suitable to you. Please note that we offer gift vouchers in any denomination subject to a minimum of Rs. 500. 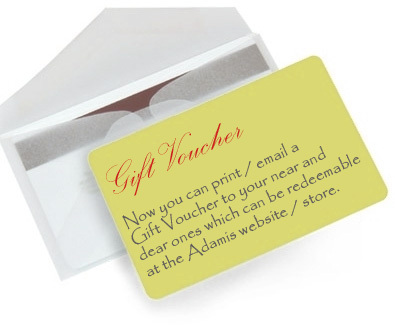 Gift vouchers may be redeemed online at www.adamis.in or at exclusive adamis stores. Gift vouchers may be combined with other forms of payment while placing an order.